AirBorn make connectors are known for its high quality, versatility and on-time delivery. It pioneered in the development of W-Series printed circuit board connectors and offers a variety of styles and sizes to meet customer’s requirements. “M” Series – Qualified to MIL-C-83513 with up to 100 contacts. “R” Series – Qualified to MIL-C-55302 with up to 206 contacts. “WB” & “W” Series – Qualified to MIL-C-55302 with up to 208 contacts. 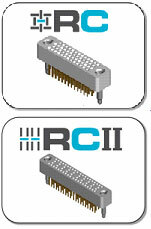 1-Row, 2-Row, 3-Row and 4-Row Connectors. AirBorn is pleased to offer a complete line of MicroD (M-Series) high-reliability flex jumper cables to satisfy your board-to-board/box-to-box interconnect needs. The flex jumpers are shipped with hardware attached in a variety of configurations and range in length from 3″ to 36″ as standard. Longer lengths are possible on single- and double-sided flex applications. Rigid flex jumpers are also available beginning at 4″ lengths***. Higher temperature solutions greater than 250°F are also an option. A variety of quick-turn, low-volume connector solutions are possible from straddle mount (SMT) to plated through-hole (PTH). AirBorn is pleased to offer a complete line of MicroD (M-Series) high-reliability flex jumper cables to satisfy your board-to-board/ box-to-box interconnect needs. The flex jumpers are shipped with hardware attached in a variety of configurations and range in length from 3″ to 36″ as standard. Longer lengths are possible on single- and double-sided flex applications. Rigid flex jumpers are also available beginning at 4″ lengths***. Higher temperature solutions greater than 250°F are also an option. A variety of quick-turn, low-volume connector solutions are possible from straddle mount (SMT) to plated through-hole (PTH). AirBorn introduces a Micro-D, multi-gigabit high-speed connector, designed to meet the performance requirements of MIL-DTL-83513, where applicable. This rugged connector system is designed to handle LVDS serial bus signals like IEEE 1394, Ethernet, serial rapid IO, etc. This versatile product has a range from one to ten high-speed modules and up to fifty signal contacts making it ideal for most high-reliability applications. The AirBorn microSI product line is designed to meet requirements for high-speed/signal integrity applications while still delivering the reliability customers have come to expect from AirBorn. MicroSI delivers flexibility by design, offering vertical board mount, right angle board mount, and cable I/O configurations supporting 1X, 4X, and 8X 100 Ω and 85 Ω differential serial buses. Its balanced design limits skew within pairs. The MIL-DTL-83513 (Micro-D) qualified contact system and metal shells ensure ruggedness and durability. The AirBorn stackable compliant connector family is one of AirBorn’s solutions for high-density, board-to-board stacking applications. This connector family is available in 0.075” contact spacing and 100 Ω and 85 Ω differential serial buses. The RZ family of high-density, board-to-board or flex circuit stacking applications is unique, offering users a reliable one-piece contact system. Its solder-less interconnect is compressed or “sandwiched” under pressure between parallel printed wiring boards or between a printed wiring board and other electronic components such as an IC or multichip module. Customer configurations available to meet your specific design needs. The AirBorn verSI (versatile connectors with high-speed signal integrity) open-pin field product line is designed to meet the requirements for high-speed/high-density/signal integrity 100 Ω and 85 Ω differential serial bus applications while still delivering the reliability customers have come to expect from AirBorn. AirBorn has expanded their M-Series product line to include 1-row connectors in wire/cable and board-mount applications. Review specific families using the links below for more information or visit the full M-Series catalog. AirBorn continues to expand their connector accessory products with a range of solutions to support standard and custom connector usage, harness assemblies and box builds. Their design capability and experience in the interconnect industry enagles us to offer a wide range of accessory solutions to meet your specific demands. For a full accessories catalog please CLICK HERE!